Zinc (Zn) and boron (B) are the most limiting micronutrients in production areas of sugarcane in Southeast Brazil. The study tested the hypothesis that applications of Zn and B in planting play a key role in sugarcane yield, not only in the first sugarcane crop cycle but also in the following crop cycle. An experiment with a 4 × 3 factorial design was established in an Ultisol in Alta Floresta, São Paulo, Brazil, with three replications. Four Zn rates (0, 2, 4, and 6 kg ha−1 Zn as ZnSO4) and three B rates (0, 1, and 2 kg ha−1 B as H3BO3) were applied in planting furrow, and yield parameters were evaluated at the first and second year. Additionally, leaching of B was evaluated during 64 days of incubation using soil columns under controlled conditions. Results show that there was no interaction between B and Zn applications in sugarcane yield. Application of Zn showed residual effect by improving sugarcane yield in the second year; Zn also improved quality parameters of sugarcane (pol and fiber). In soils with adequate levels of available Zn (> 1.2 mg dm−3), the rate of 3.9 kg ha−1 of Zn promoted the highest yields in the first ratoon. In opposite, B rates reduced sugarcane yield in the first and second ratoon, even under low B rates (1 kg ha−1). Leaching of B totaled 22% of applied B during 64 days of incubation. The finding is that Zn fertilization with zinc sulfate plays a key role in sugarcane yield, while B application in planting furrow using boric acid should be replaced by a more integrated management of B, including different sources of B and methods of application. 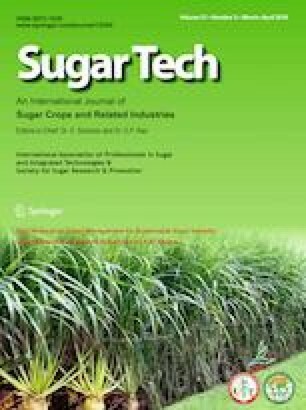 The authors acknowledge the sugarcane mill (Usina Alto Alegre, Unidade Floresta) for providing field and operational support. R. Otto received a research productivity fellowship from the National Council for Scientific and Technological Development (CNPq; Grant #308007/2016-6). FFM, GCV, and CST carried out the experiment. RO and VC involved in planning the work. RFA, RO, and FFM contributed to the interpretation of the results. All authors discussed the results, commented on the manuscript, and contributed to the final manuscript. Faostat. 2018. Food and agriculture organization of the United Nations. Statistics Division. http://www.fao.org/faostat/en/#data. Accessed 15 August 2018. Ridesa. Rede Interuniversitária para o Desenvolvimento do Setor Sucroalcooleiro. https://www.ridesa.com.br/variedades. Accessed 15 November 2018.